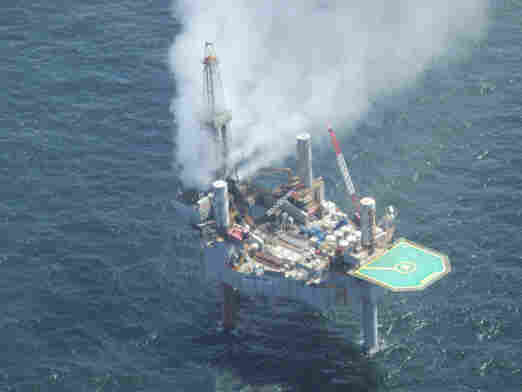 Gas Well On Fire After Blowout In Gulf Of Mexico : The Two-Way A blowout on Tuesday forced 44 workers to evacuate. Later, a blaze broke out. Officials say the damage to the environment should not come close to that caused by the 2010 Deepwater Horizon accident. Before a blaze broke out, a cloud of gas could be seen rising Tuesday from the Hercules 265 drilling rig off the coast of Louisiana. A natural gas well off the coast of Louisiana was on fire Wednesday, one day after a blowout forced 44 workers to evacuate. There were no injuries reported. The Bureau of Safety and Environmental Enforcement says the mishap at Well A-3 below a "Hercules 265 jack-up rig," about 55 miles off the Louisiana coast, was first reported around 9:45 a.m. ET Tuesday. "Officials stressed that Tuesday's blowout wouldn't be close to as damaging as the 2010 BP oil spill, in which an oil rig, the Deepwater Horizon, exploded off the Louisiana coast, killing 11 workers and eventually spewing millions of gallons of oil into the Gulf of Mexico." According to the BSEE, "inspectors reported a cloud of natural gas above the rig and a light sheen on the water one-half mile by 50 feet in area that is quickly dissipating." A firefighting vessel was said to be on the scene. A BSEE spokesman tells NPR that beams supporting the rig have "folded" and the structure has partially collapsed.